Why is Chris holding a pack of gum in the video above? To make a fairly obvious point: Marketing yourself as a real estate pro is MUCH DIFFERENT than marketing a pack a gum. The type of marketing that stores use to sell a pack of gum is called “Reptilian Brain” or “Lizard Brain” marketing. It’s marketing that relies on the consumer reacting to stimuli. Bright colors. A tasty image. You get it. In real estate, when we’re marketing to clients, we’re marketing for TRUST. According to NAR’s annual profile of homebuyers and sellers, sellers chose an agent to sell their home based on two main factors: their reputation and integrity. Sellers want to trust that their agent is competent at their job. That’s why the Listing Expert Agent Program is centered around gaining listing expertise and then building an identity as an expert in your market. Because while lizard-brained marketing doesn’t work, subtle (but powerful) strategies of influence will. In Dr. Cialdini seminal work Influence, he identifies 6 principles of persuasion that make people say “Yes.” One of those principles is Authority. Cialdini found that we are heavily influenced by people we believe to be authorities or experts. For example, one of his studies found people are more likely to trust someone wearing a lab coat (which conveys a sense of authority and expertise) versus someone not wearing one. Here’s another example. One firm changed their receptionist’s response to inbound calls. Instead of just transferring a call, the receptionist instead said, “Let me transfer you to one of our real estate experts.” By adding that simple phrase, they saw a significant increase in appointments and closed deals. To win more listings, you need your own “lab coat.” You need to convey your expertise to sellers in your target market, niche, or selected demographic. There are lots of ways to do that, and we spend a good portion of LEAP going through them. But today, to help you get a head start, we want to share a quick tool you can use to bring forth your expertise and value right from the beginning. It’s called the Professional Dossier. 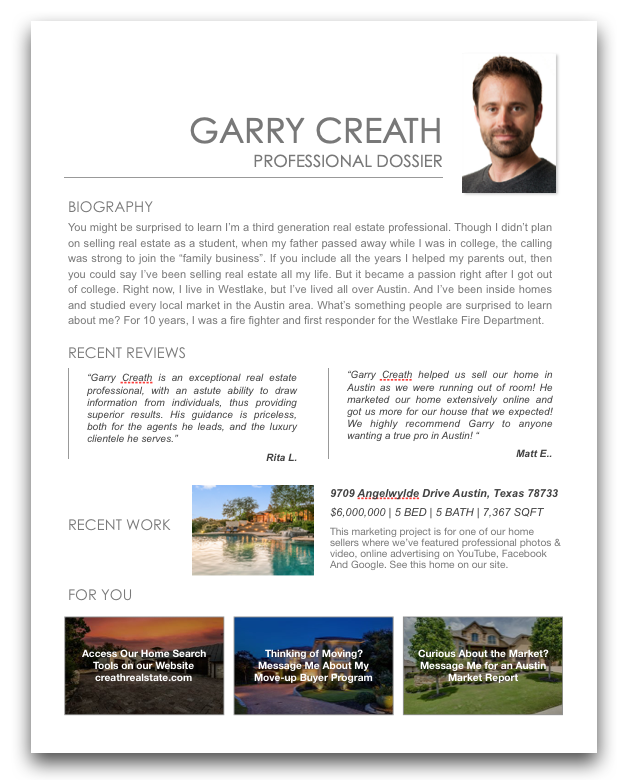 The Professional Dossier is essentially a resume for real estate. It’s a PDF that shows off your skills, expertise, and knowledge to potential clients, and does some of the quick, early work of positioning you as an expert. It’s your lab coat. As you can see, it includes a short bio, recent work, client testimonials, and some specific offers of help. Not only does this tool help set you up as an expert, it also becomes a powerful referral tool for your past clients. It’s something they can easily pass along to a friend thinking of buying or selling their home. So, there’s a little taste of the Listing Expert Agent Program & Certification. In LEAP, we spend a significant amount of time showing you how to position yourself as THE expert and authority in your target market. We’ve included a ton of campaigns, templates (including a professional dossier template), and tools to make doing so easy — EVEN if you’re new to a market or going up against established agents. And that’s just a small portion of what LEAP contains! We also include how to find new listing opportunities (including our top 10 favorite sources for new listings), a brand new listing presentation, step-by-step tutorials for acing listing appointments, scripts for handling objections, marketing that sells the listings and sells the seller…. It’s going to be your one-stop for EVERYTHING listing, and we think you’re going to love it. Stay tuned for more information on LEAP this week! And if you’re starting to think, “Yeah, I’d like more listings. This program sounds like it’s for me”… You want to mark your calendars for Black Friday. We’re going to release LEAP with a special offer for everyone who jumps in early! Sounds like a great new program. Looking forward to it.